Let's be real. No one likes it when they get acne. Acne problems are not just with women. Men are equally prone to them and in some cases men face them with more severity. Men can get acne either on their face or on their back. It may occur as a result of hormonal imbalance or clogged pores of an oily skin which leads to bacterial growth. If you sweat too much, then it can get even worse for you. Acne on the face is easier to get rid of than those on the back. Here we have compiled a list of cures for acne in men. Let's take a look! Make sure than your skin is clean at all times. Yes, it is true that acne does not occur because of dirty skin. But a good skin care routine will aid to your acne prevention treatment. For this, you need to wash your face regularly and moisturize it to prevent it from drying up. You can go for the cleansers available in the market but avoid the ones with beads as they may cause irritation. 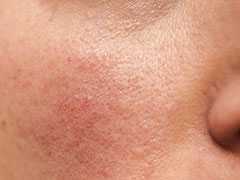 Rosacea or adult acne can occur to anyone, but is more common fair-skinned middle age women. It causes redness on cheeks and nose. The redness can spread on your back, chest ears and forehead. Yes, men need to shave themselves regularly but this should be done with intense care. This is not only to protect yourself from cutting your skin, but also to save it from pain or irritation due to acne. Ensure that the razor you use is clean. Make use of an antibiotic foam if you have a sensitive skin. Avoid those parts of your skin where you have acne to prevent pain and irritation. Drinking lots of water will prevent you from acne problems. It helps to eliminate those toxins from your body which lead to such problems, and maintain balance in the body for its normal functioning. Mostly men are not very fond of chocolates and sweets, but if you are one of those who are extremely fond of it, then reduce your sugar intake because it is one of the causes of that irritating acne on your face. It is that one enemy of your skin which sometimes does not go away easily. It will stay there on your face for long and irritate you. In this case, you may go for some lotions available in the market for getting rid of this problem but do consult a physician before using one. Acne problems aren't a major issue now, there are a number of scrubs and creams available in the market but yes, consulting a dermatologist before using will be helpful.